If you have come here first, then do yourself a favour and go away and look at make a proper GTV! And don't dare look at how to make a proper PTV (I won't even provide the link yet!) until you have looked at the previous make a proper GTV and this make a proper CTV document. No, seriously! Go back and do the GTV thing. Why am I being so pedantic? Well, because I am ….. and also because there are good academic reasons that relate to your understanding and performance. The concepts put forward by ICRU50/ICRU62 for the construction of the volumes are SEQUENTIAL in generation, underlying skills and decision making. Along with the radiological anatomy knowledge, you also need to apply a lot of clinical knowledge relating to where cancers are likely to be next. To put it into oncologese (the language of oncologists! ), you are marking areas that are "at risk". These areas are regarded as being at risk because of the particular clinical patterns of cancer growth in relation to its stage and histology. So you can see that marking a CTV is more complex than marking a GTV. Just a couple of examples to demonstrate what I mean. there is a variable potential nodal spread in Head & Neck Cancer. In nasopharyngeal cancer it is considered routine to treat all nodal groups apart from the submental group in front of the submandibular gland, because even in T1N0 cases the risk for subclinical disease is 50% and so warrants prophylactic therapy. However, in a T1N0 laryngeal cancer, the risk of subclinical disease is <10% and so prophylactic nodal irradiation is overkill and universally accepted as unnecessary. it is usually expected that there will be a small amount of local infiltration relating to extracapsular extension (ECE) around affected lymph nodes without radiological evidence of ECE. Other cancers however can be beset with extensive amounts of local infiltration. It is usual to consider margins of AT LEAST 5 cm of normal tissues when treating cancers like Sarcoma. In the case of Brain Cancer, pathological examinations have revealed glioblastoma cells up to 2cm from the leading edge of the associated oedema. In H&N cancer, where nodes show a clear margin, 3mm is probably sufficient to cover unseen extension. This brings us back to the issue of drawing a CTV. There are once again some high-level 'rules' about marking up a CTV that should be laid out for all to see and consider. the CTV is defined to, has to, must, needs to include ''ALL OF THE GTV'' at the least. AAM : Am I getting the point across? I know. I'm being pedantic again! If this is true (and it is, trust me, I'm a doctor! ), then when you come to put on a CTV, you must have completed the first step already (putting on the GTV). Most planning software allows you to copy and rename volumes, and so your second step might be to just copy GTV and rename it 'CTV'. 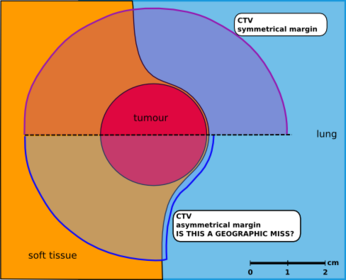 Then you can proceed to alter the CTV to fit the clinical behaviour of the patient's cancer - but you never, ever, ever make the CTV smaller than the GTV. Think about it - how can the area of subclinical risk be smaller than the visible tumour? Ah yes, I can hear you say "what about if there is no GTV?" And isn't it one of the infuriating parts of medicine that there is always an exception? The approach that I would counsel is to approach the problem from the majority occurrence and develop a standard approach, rather than throwing your hands up in frustration and doing the laisse faire thing. Where there is no GTV, I just volume the CTV based on exactly the same patterns as written here. Pre-treatment scans can be helpful in this regard. The additional question that you need to consider is "has the previous treatment altered the risk assessment for any at risk areas?" For example, a case of early stage Hodgkin's Lymphoma having an excellent response after a course of just ABVD x 3 might prompt the decision to exclude any previously uninvolved nodal regions, that is, to treat the only initial sites of clinical disease. Presuming that the CT scan shows well-delineated tissue planes, this determination rarely presents a problem if anatomical barriers are identified and respected. I have included a image to demonstrate this issue. There is a tumour in soft tissue which in turn is immediately beside lung tissue. It is known that the tumour can infiltrate up to 2cm even if the soft tissue looks clean, but rarely invades lung. While it is tempting to use the auto-expand option in the software using the formula: GTV + 2cm = CTV. This will result in the situation portrayed in the upper half of the diagram where the CTV has been expanded into the lung tissue also and so any treatment plan devised after this cannot spare the lung even if possible. Since the lung is not at clinical risk, it should not be included in the CTV. The diagram puts the question very clearly - is trimming the CTV in an area that is not at risk going result in a geographical miss? I think that there is a degree of uncertainty about whether we are good enough at placing our volumes. This can only be determined by systematic quality assurance of volume placement. I believe that there are two important issues to be considered. Firstly, this QA should be undertaken on ROUTINE cases (we all do unusual cases poorly, that's why they are called 'unusual'). Secondly this QA requires a peer or superior to watch the process and have the clinical logic explained. Oh, in answer to the geographical miss question, there is no miss likely to result from the lung exclusion in the lower part of the image. (AAM : Trust me, IAD!) You can't miss what isn't there! CTV voluming is a discrete process, and the CTV is a discrete volume. The GTV is determined by abnormalities on the planning images (CT/MRI/PET). The only question to be asked is "is this abnormality cancer?". The CTV is determined by anatomical boundaries. In another document the PTV is addressed (make a proper PTV), and once you have read that document, you will see very clearly that that process is different and distinct from the CTV process. Of course you haven't read that document because I told you at the start to begin with make a proper GTV, then read this one (make a proper CTV) and FINALLY make a proper PTV. Greater minds than you or I determined these concepts to be sequential and so we should show respect and follow their urgings, then we can "stand on the shoulders of giants".